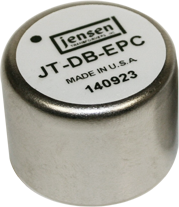 These high-ratio step-down transformers (line-level in, mic-level out) deliver extended low-frequency and Bessel-tailored high-frequency responses, resulting in ultra-low time-domain distortion (DLP). They also use Jensen-pioneered multiple Faraday shields for unmatched immunity to hum, buzz, and RF interference. These noise problems can plague systems where guitars and stage instruments (keyboards, samplers, computer, and drum machines) are far from the mixer and abnormally high ground-voltage-differences are the norm. The carefully-controlled high-frequency response removes ultra-sonic “hard digital edge” from signals, resulting in a sonic clarity that has made them famous around the world. Each transformer is enclosed in a MuMETAL® magnetic shielding can to reduce hum caused by any nearby magnetic fields. Double Faraday shields and a 30 dB magnetic shield can are standard.